YG Entertainment is steaming ahead on its latest hip hop project by completing its artist line up. After unveiling GD and Taeyang as the members of their first hip hop project group, Masta Wu, iKON‘s Bobby, and Dok2 now have been confirmed as YG Entertainment’s new trio for the second project. True to YG Mix & Match style, the three rappers were announced one by one only hours apart from one another generating social media hype and responses. Netizens have flocked to comment on the unexpected line up. 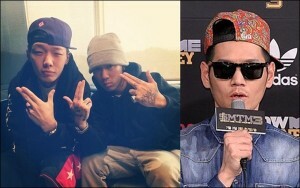 While rumors of iKON’s Bobby being chosen for the project had circulated widely, the appointment of Masta Wu and Dok2 came as a surprise to many. Having said that, Dok2 isn’t someone new in collaborating with YG. Dok2 teamed up with Bobby to win the rap competition program Show Me the Money 3. He also collaborated with Epik High on the group’s latest album Shoebox. At the same time, Masta Wu has released two albums since signing to YG, Masta Peace and Mass Wu Pt.2, and has done numerous collaborations with other labelmates, notably Se7en, PSY and Wheesung. There has been a lot of excitement surrounding this upcoming YG Hip Hop Project’s release on December 2. But as we have seen with GD and Taeyang’s collaboration single “Good Boy,” a little bit of caution should be warranted. What do you guys think? What kind of song are you expecting?